If elected to the U.S. House in 2014, I will oppose the Card Check bill, as well as the Employee Free Choice Act, and all legislation designed to empower union bosses. The exclusive authority to regulate organized labor occurring in the states is not an enumerated power granted to the federal government in the Constitution. The federal government should only have the exclusive authority to regulate labor which occurs in the District of Columbia and in the nation's overseas possessions, and labor in industries over which the federal government exercises duly delegated constitutional authorities to regulate. I would sponsor efforts to return the power to regulate and enforce all other areas of labor policy to the states - and to the people, the labor departments and bureaus, and the local governments within them - as soon as possible. I believe that all federal legislation aiming to protect the so-called rights of unions and employers alike is specific legislation affording a special privilege; the General Welfare Clause was included in the Constitution in order to prohibit legislation which does not promote the welfare of all of the people equally. Special legislation concerning unions, enterprises, business associations, and lobbyists and political action committees from both sides of the aisle has only served to empower all of these organizations to participate in the regulation and control of the people. This has resulted in diminished political power for ordinary taxpayers, diminished economic power for ordinary consumers, and a less productive economy. I oppose the Card Check bill and the Employee Free Choice Act not because it should be illegal or any more difficult to join or organize a union, nor easier for employers to fire people for engaging in legal union activity. I take this position because the taxpayers – as both the employers of federal workers and the consumers of the services they provide – have the responsibility to ensure that the power of organized labor does not make the delivery of such services unaffordable. Federal workers should bear in mind that they, too, are consumers and taxpayers, and therefore need affordable government just like the rest of us. Furthermore, I take this position in order to protect the rights of minorities; in this case, the rights of minority unions alongside those of majority unions. Gaining majority status for being the certified winner in a National Labor Relations Board election should not be the sole method of invoking bargaining obligations on the part of employers; plural and proportional representation would be legal alternatives if legislation requiring majority status were abolished. I believe that majority unions should have a role in such bargaining, but so should minority unions, as well as consumers and shareholders, and - in the case of labor by government employees – taxpayers. But agreements between these parties can be achieved through private arbitration (following mutual company and union agreement about which materially uninterested agency shall be deemed trustworthy to arbitrate the dispute) and liens on business properties, rather than through litigation and motivated state intervention concerning what sort of bargaining between companies and unions shall be acceptable. I do not support any organization that interferes with individual freedom to associate through federally protected concerted activity for mutual aid and protection, and to bargain collectively on a members-only basis. I take this position regardless of whether it is an employer or a union interfering with these freedoms, and regardless of whether there is an established majority union in the workplace. 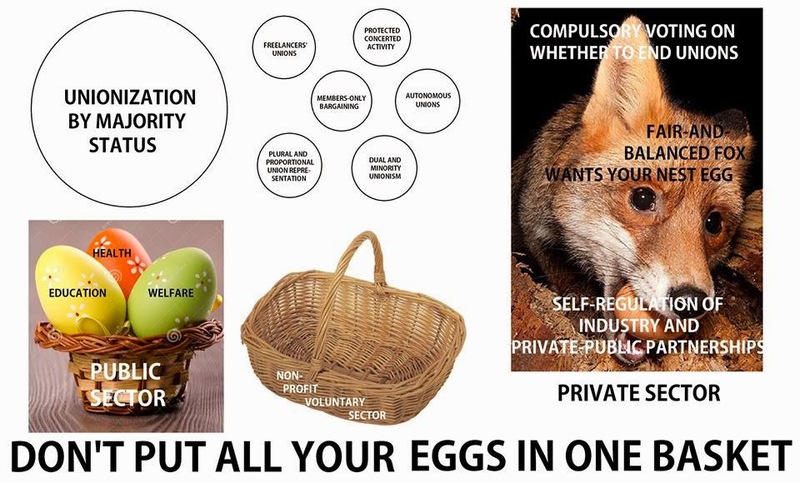 Majority unionists should understand that their desire to be the only union in the workplace only puts all of their eggs in one basket. The federal law requiring majority status vote for a union to remain in existence only exposes unions to the risk that a future federal law could empower government to require all eligible voters to weigh in on a union election at their workplace, even if they'd rather not pick a side. I believe that compulsory union voting is one of the most significant sources of political polarization and divisiveness in America today. As long as majority unions are free to appeal to the federal government to either abolish minority unions or diminish their power to negotiate, the prevailing union shop / closed shop dichotomy in unionized workplaces can only serve to perpetuate an environment of monopolistic competition over the representation of labor. I oppose such uses of coercive state power to enforce unconstitutional special legislation; this is activity which should be considered in violation of the Sherman Antitrust Act. Unless and until it becomes politically feasible to repeal all special federal legislation empowering unions and businesses alike, I will propose amendments to the Constitution authorizing the federal government to enjoin states against giving such illegal special privileges and monopoly representation powers to majority unions (often referred to as a “national Right to Work amendment”). I take this position because in 1985 the Supreme Court ruled that nobody may legally be required to become a full member of a union as a condition of continued employment. Although the federal government should not be in the business of telling people in the states how to regulate labor therein, in regards to my legislative position on the federal government's jurisdiction over labor (in the District of Columbia, overseas, and in industries it was duly delegated the authority to regulate) - and in regards to my general recommendations for the states – I believe that individual freedom to choose whether to join a union can coexist alongside workers desiring solidarity in collective bargaining. I also believe that each government, in its respective sphere of authority to regulate labor, should provide for a more collaborative negotiation between employers and non-employers from across a wider and more diverse set of economic organizations. I would suggest that this be done by prohibiting unions (especially pro-business majority unions known as “business unions”) from making contracts with employers in a manner which does not welcome the input of ordinary people. This includes the input of not only taxpayers, shareholders, and non-shareholding but nonetheless affected “stakeholders”, but most importantly of potential employees who are all too often underinformed about their rights as a result of such contracts. Unconstitutionally empowering the federal government to nationalize companies and then to award controlling stakes in them to the public and/or to labor unions with majority status is not the only way to ensure that everyone gets their fair share of influence over how our society and economy are governed. There is a way to passively – rather than actively and coercively – allow ownership and management responsibilities to transition into the hands of workers and consumers. Moreover, there is a way to do this while promoting economic growth, without crushing the entrepreneurial spirit of the people or causing people to work past their planned retirement ages unnecessarily, and without diminishing the freedoms of individual workers and minority unions to have meaningful influence on the workplace and in the industry of their choice. My recommendation would involve immediately closing all tax loopholes and taxing all corporate income (including capital gains) at a flat base rate, and from there offering tax credits in order to incentivize owners and managers of firms to take steps planning and providing for the gradual transition of ownership and management of such firms to organization modes which are more hospitable to egalitarianism and a balance of workers' rights with the interests of consumers. Firms in the public and private sectors alike would be offered tax incentives to essentially evolve into one of any number of types of organizations. Examples of such organizations should include open shop unions; dual and minority unions; workplaces with members-only collective bargaining agreements; autonomous unions and guilds; syndicates; egalitarian labor-managed firms; cooperative corporations; consumer-driven cooperatives; worker-consumer cooperatives (i.e., mutuals); mutual aid societies; cooperative wholesale societies; and voluntary cooperatives. I would additionally recommend a hybrid example, combining the functions of as many of these types of organizations as possible into one firm; that is, a voluntary worker-consumer wholesale purchasing cooperative. Such a cooperative should coordinate the planning of purchasing as tightly as possible with other cooperatives like it, and be required to serve any customer who comes to it (on the condition that he or she does not request unjustifiable quantities of the goods and services offered). Although coordinating their efforts would save the most money, such cooperatives should remain technically separate organizations, function in a market system, be free to accept and give charitable donations, and be free to have differing practices regarding in which circumstances additional quantities of goods and services afforded to certain individuals above the base level are justifiable. The main objective of such a cadre of firms would be to provide a counterbalance against the oligopoly powers of sellers and distributors of labor and capital pertaining to the relevant goods and services produced by said firms. Such firms would accomplish this by pooling wealth in order to save costs in the purchasing and delivery of the relevant goods and services, providing for the affordable organization of production. This would occur under the condition of regular negotiation concerning any and all potential conflict which is likely to arise between consumers' demand for low prices and workers' demand for high compensation. A worker who consumes the very good or service which he or she produces, possesses good management skills, and has constructive suggestions concerning improving the workplace, might be asked to serve as a tie-breaking vote in any leadership or management of such a firm. The State of Oregon can do better on labor policy without the obstructive effects of association with the federal government. The federal government's ownership of vast tracts of land in the state inhibits (in those areas) the kind of productive labor which would allow the state to afford such a relationship, if only the state had the ability to fully tax the value of the land within it, instead of resorting to taxing the production of its own taxpayers through taxes on individual income. Whether they call the compensation they desire “all the fruits” or “the full product” of their labor, I would urge people of the left and right alike to oppose the eventual abolition of the individual income tax.